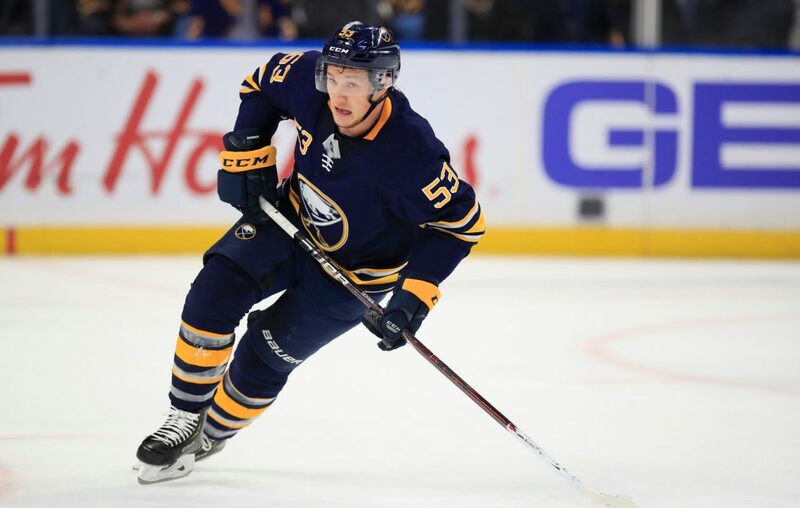 RALEIGH, N.C. – Boos reverberated throughout PNC Arena Saturday night when Jeff Skinner ended the scoring drought that became symbolic of the Buffalo Sabres' fall from grace. Skinner, facing his former team on his old home ice for a second time this season, shot the puck between Carolina Hurricanes goalie Curtis McElhinney's leg pads to halt the goalless streak at 199 minutes, 58 seconds that spanned nine days. Skinner's heroics that avoided a fourth consecutive shut out could not expel the familiar problems that have plagued this team since opening night in October. Leaky goaltending, a costly defensive error and not enough offense caused the Sabres to drop a seventh consecutive game, as they lost to the Hurricanes, 4-2. Buffalo (30-32-9) has lost 13 of its last 15 games and has won only one game in March, a month in which it needed to make an unprecedented run in order to not miss the playoffs for an eighth straight year. "I think there’s a lot to like about the way we played tonight, but it’s tough when you don’t get the result," said Jack Eichel, who had six shots on goal in his return from suspension. The Sabres out-shot the Hurricanes, 37-29, including 17-6 in the final 20 minutes, and scored only 2:18 into the game when Skinner snapped his own 13-game goalless drought. His 37th of the season, which matched his previous career high, relieved some of the pressure and angst that has followed the Sabres this week, Skinner admitted. Failing to score a goal would have made Buffalo the sixth team in NHL history to suffer four straight shutouts. It has not been done in the expansion era since the first-year 1967-68 Oakland Seals. The lead nearly got pushed to two goals when Skinner hit the post, and Alex Nylander redirected Matt Hunwick's pass wide of the net. However, the Sabres failed to have a shot on goal for the final 10:23 of the first period. They had a number of chances in the second and third periods, only to be stopped by McElhinney, who finished with 35 saves. Linus Ullmark could not do the same for the Sabres. Jordan Martinook's wrist shot from the right-wing circle leaked past Ullmark and into the crease, where Lucas Wallmark jammed the puck over the goal line to tie the score, 1-1, with 6:08 left in the first period. Ullmark was not at fault on the second goal, which came only 1:07 into the second period. Rather than staying in front of the net, Eichel chose to skate away from Andrei Svechnikov, who collected a backdoor pass from Teuvo Teravainen and chipped the puck into the back of the net. "I have to be better there in that situation," Eichel said. The other two goals were on Ullmark. Even Justin Williams could not believe that his bad-angle shot from near the left-wing boards and below the faceoff dot beat Ullmark for a 3-1 lead with 2:51 left in the second period. Sabres defenseman Brandon Montour had tight defensive coverage on Jordan Staal in the high slot, only to see Staal spin left and fire a backhanded shot that beat Ullmark for a 4-1 lead with 4:14 remaining in the game. Since the Sabres' 10-game winning streak, Ullmark and Carter Hutton own the league's second- and fourth-worst goals-against average, respectively, among goalies with at least 24 games played. Ullmark has lost seven of his last eight starts while allowing four or more goals five times. "I’m trying my best out there, but it isn’t enough," Ullmark lamented. "Not happy with how I’ve been playing lately. The boys are trying their best to create scoring opportunities, and I let the guys down tonight." Coach Phil Housley defended Ullmark, noting how important the Sabres' goaltending has been when the team has been successful. While Housley said he was pleased with how his offense generated more chances, he was not entirely satisfied. The Sabres failed to score on their three shots during two power-play opportunities and did not get their second goal until Zemgus Girgensons fired a shot from the high slot that beat McElhinney with 1:01 left in the game. "It’s tough, but we have to score more than one goal," Housley said when asked of Ullmark's critical self-assessment. "He’s been a bright spot for us the whole season. Would he want to get some of those goals back? I’m sure he would. But that’s just where we’re at as a group. We need to find a way to score more goals, but we are creating." The Sabres are tied with Ottawa for the fewest points (33) in the NHL since they won their 10th game in a row on Nov. 27. They are in jeopardy of becoming the first team in league history to win 10 games in a row and lose 10 games in a row in the same season. They are also going to be only the second team in NHL history to not make the playoffs in the same season in which they had a 10-game winning streak. While one goal alleviated some stress, there are still 11 games remaining. "Obviously when you’re getting into a slide like that it sort of becomes the topic that snowballs into something bigger than it is," Skinner said. "For us, that’s just the way it’s going right now."